Everest base camp trekking is customized trail and it is perhaps the most renowned in the world. 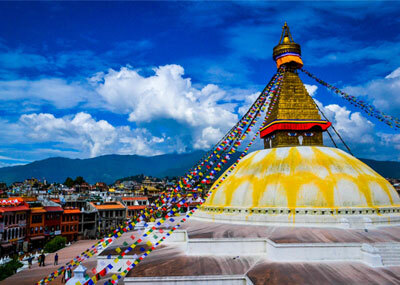 This trekking is perfect tour for a trekker to begin adventure career in Nepal. This surprising walking trail follows through foothill of world's highest peak Mt. Everest and other beautiful peaks Ama Dablam, Pumori, Lhotse, Nupse, Cho Oyo and many more. This is homeland of brave mountaineer Sherpa and hospitable Buddhist people. Everest base camp trekking is immersing in the wonders of beautiful countryside with settlement of peaceful blue roofed houses, colorful Buddhist prayer flags, perfumed rhododendron flower, spectacular sceneries, prayer walls and Buddhist monasteries. 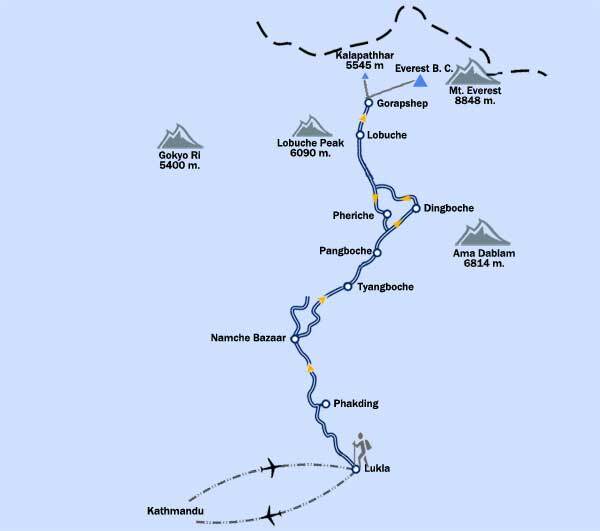 It is half an hour flight from Kathmandu to Lukla to begin Everest base camp trekking. The trekking follows through delightful Sherpa villages: small settlement of Sherpa in Phakding, prosperous Sherpa capital Namche Bazaar, Tyangboche with its impressive monastery, the quieter farming village of Dingboche, Lobuche, to arrive Gorapshep. Every point along this route rewards awe amidst breath-taking view. Finally hike up to Kalapathar 5554 m, a rocky hill to be rewarded with an amazing 360 degree panorama of spectacular 8000 m. peaks each one framing the world’s highest mountain. Gorapshep is base for trekkers to hike to Mt. Everest base camp, where mountaineer settle their camp to conquer the summit of Mt. Everest. The journey returns the same way till Lukla and fly back to Kathmandu. Day 04: Phakding – Namche Bazaar, trekking and overnight in Teahouse. Day 05: Namche Bazaar – Free day. Day 06: Namche Bazaar – Tyangboche, trekking and overnight in Teahouse. Day 07: Tyangboche – Dingboche, trekking and overnight in Teahouse. Day 08: Dingboche – Free day. Day 09: Dingboche – Labuche, trekking and overnight in Teahouse. Day 10: Lobuche – Gorapshep, trekking, hike to Everest Base camp, return to Gorapshep and overnight in Teahouse. Day 12: Lobuche – Phortse, trekking and overnight in Teahouse. Day 13: Phortse – Namche Bazaar, trekking and overnight in Teahouse. Day 14: Namche Bazaar – Lukla, trekking and overnight in Teahouse. Day 15: Lukla – Kathmandu by flight. Day 16: Kathmandu – Sight seeing.